We could not carry out our research without the help of our bright and hardworking undergraduate research assistants (RA's)! 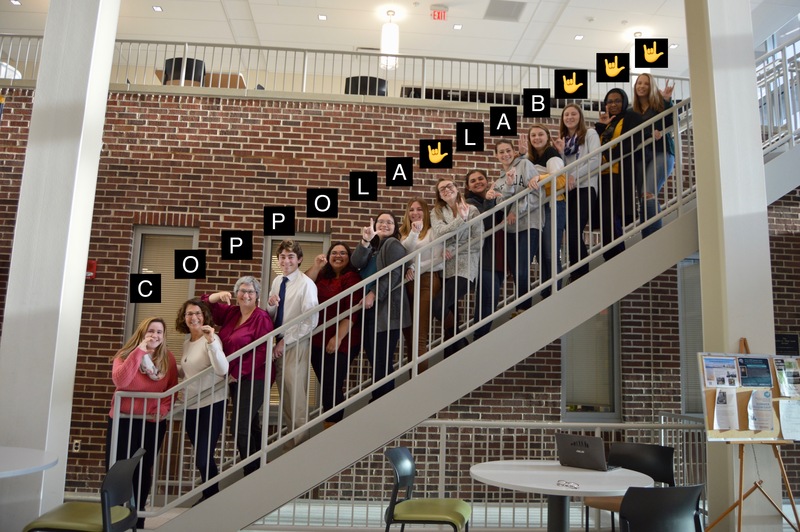 RA's in the lab learn about how psychological and linguistic research is conducted via hands-on experience in our lab. Your work will include data entry, coding of videos of signing, data analysis, and even assisting in data collection. You will learn about the theory and research questions motivating our projects, and about sign language and language acquisition/emergence research generally. Finally, you will learn about Deaf culture, and about ethical issues concerning study of D/deaf individuals. Interested students must commit to working at least 6 hours per week for an entire semester, and will receive course credit for working in the lab (1 credit per 3 hours of work). The course would appear on your transcript as an independent study with Marie Coppola. We prefer students who are able to commit to at least two semesters in the lab. Students who do well in the independent study may also have the option of doing an honors thesis, in which they develop their own research question to address. Few things look better on a graduate school application than an honors thesis that an undergraduate conceives and executes. Once you have completed the questionnaire, please email coppolalab@gmail.com to let us know that you have submitted it. Please contact Dr. Coppola at marie.coppola@uconn.edu.